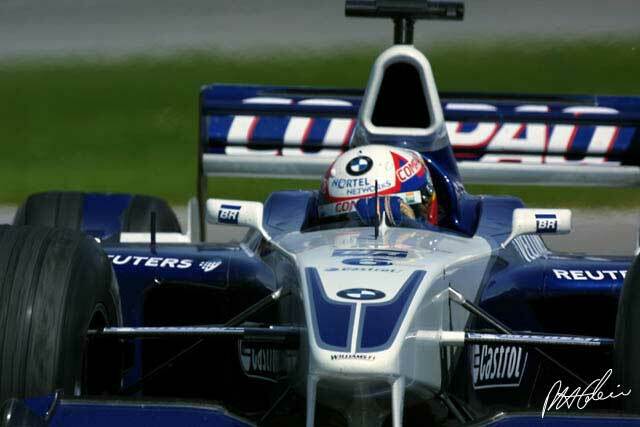 He's led his first GP, made his first passing move on Michael Schumacher, and shown that he is fulfilling all of the expectation heaped upon him when he joined BMW Williams. Small wonder that everybody is still talking about Juan Pablo Montoya long after his ill fortune in the Brazilian GP has been consigned to history. Even Michael Schumacher admits that Juan Pablo Montoya is going to be bad news, having been on the receiving end of the Colombian's dramatic overtaking move on the third lap of the Brazilian GP and then having to watch the back of the BMW Williams as long as he could stay close enough to keep it in sight. After the race the German put a brave face on the situation, at a time when some had expected him to rant about Montoya's tactic not just in squeezing past but in deliberately making a point by holding him out wide in the first corner. But the World Champion is an old hand at the psychological game of F1. If the move angered him, he kept it well hidden. Instead, by heaping praise on his new rival, he defused the situation without making himself seem like a whinger. Smart thinking. 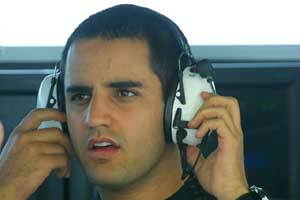 "Montoya has no respect for other drivers," Schumacher said, "but then neither did I when I started. That's just how you have to be. What's the point of being awed by someone that you have to beat? If you don't believe that you are faster, you should not be trying to beat them." Schumacher believes that having such drivers in F1 is great for the sport - so long ads they are not in the same team as him. But San Marino GP winner Ralf Schumacher has no problems with his speedy team-mate. "Juan Pablo did a great job in Brazil, just as I was able to do in Italy, and we are working well as a team. It's good when two drivers push each other along. You get much better performance from both that way." It's not just Montoya's track performance that has impressed since he left the world of ChampCars to come to F1. His lucidity and his way of expressing himself is reminiscent of Ayrton Senna at his most charismatic. In free practice in Brazil on Friday he was nearly caught out by the bumps of Interlagos, but his reactions kept him out of trouble. "It's really bumpy, one of the bumpiest tracks we come to," he admitted. "But it's fun. It's a good track, there's good things around. It's quite easy to make a mistake. I had a big moment out of six as you saw, but it was okay..."
For most it would have meant a trip into the gravel, but Montoya believes that current F1 cars on their softer tires are not that far behind ChampCars now in terms of controllability. One a scale of one to 10, he gives them a six or a seven. "They're a lot less forgiving in the fast corners, but in the slow corners it's the same. When you have a good balance they are okay, it's when the front end is too positive that it's a nightmare to drive. It becomes really difficult to push it. Braking's fine, fairly straightforward, not a night and day different. It gets a bit edgy at times, but you've just got to try a little bit more and a bit more to see how far you can go. If you can get all of Friday running it makes it a lot easier because you have a much better starting point. In Malaysia I was having to guess where to brake and stuff like that. In Brazil I pretty much knew where to brake and where I could improve. In San Marino, another nightmare." In Italy he really suffered from losing the first day, and that even on a track that he knows from his F3000 days. In F1 today it is very hard to make up for lost time when it comes to honing the set-up for both qualifying and the race. If Brazil was his show, San Marino was definitely Ralf's. "I like these kind of guys because we can have good fights..."
Those who watched Montoya insouciantly breaking the rules on ChampCar ovals and throwing his Ganassi Reynard around detect a similar style in F1, and perhaps at times he has been overdriving. But he says that he has not consciously changed anything. "I'm doing pretty much the same things. You've got to be a bit more precise in the fast corners, with the steering. The steering input on an F1 is a lot more direct to the car so you have to be more precise with it. But generally, in the slow corners and the rest it's pretty similar. It's quite good over the curbs." It hasn't taken him long to learn the new tracks, though he doesn't pretend that two laps in a road car are sufficient, as Kimi Raikkonen did at Sepang. "Maybe an hour or two, but to get into a decent speed base, within 20 minutes you can be there. You have the data. It's not a blind thing. You don't get into a track for a fast lap without looking at the data, you look at it and you know all the brakes and gear points, you memorize this and take it and look around the track and say, okay, brake here, lift there, stuff like that. But to do it initially you just try to learn, and go just a bit under that. And then you get to do that and you try a bit more. It does really help. From the first installation lap you do in the morning, you are thinking, okay, I'll want to put the car here and here, and you build it up from that. It's not that difficult. "It does help to go round in a road car, or even to walk the track. You say okay I turn in here, I want to place the car here, it would be nice to have it here... Doing this will give you a lot of hints. In the F1 you are sitting really low and the view is not the best one. The picture you have comes from sitting higher. Where the detail of things is concerned you can miss a lot of stuff in the F1, so by going round walking or in a road car you see a lot more stuff. It's actually better in a road car than actually walking, because walking you say I wanna turn there, but when you actually get there you think, where did I need to turn? But in a road car it's moving quicker so you get a bit of a flow." When Montoya talks of his performances, he again reminds you of Senna, always looking for that little bit extra, never being satisfied for long with the latest high points. "I pretty much feel I've played myself in," he admits. "But there's always more, more. Especially round places you've never been. You go through a corner and you say, I could have gone a bit quicker, but you are not in a position to try and go a bit quicker and lose one and a half hours of practice by going off. You can't do that, you can't afford it. You can't go on trying to improve in big chunks, because if you try to do that you are going to go off. So I'm always looking for improvement, but tiny bits. When somebody has been here two or three, maybe even 10 times, it makes it quite difficult to get to their level. But you try to improve everything at the same time and you feel, oh, this is good. And when you get somewhere and you feel happy with it, you leave that alone and you try just to be consistent, and then you try somewhere else to make an improvement." It's all thought out, before, during and after. And the results so far say that Montoya is definitely a man to watch. It's easy to forget, however, his two seasons and F3000 and his two seasons of ChampCars. This is no novice we are talking about. Both Schumachers will tell you that. "I like these kind of guys because we can have good fights," Michael said of Montoya. Nobody made a truer prediction. Thus far in his first handful of Grands Prix, Montoya has revealed sufficient speed, fabulous car control regardless of the temperature or state of his tires, an ability to go fast in qualifying but also to set consistent race lap times, an aggression and will to overtake even the best, and the intelligence and psychological strength to put it all together over a championship season. With no points on the board yet it might be asking a lot for him to challenge for this year's title, the speed of the BMW Williams notwithstanding, but all the ingredients are there. The first win will come soon, and the first championship will follow. Just ask Michael.